Since this is the simplest kind of drop-list you can do, we can dive right in. On a new worksheet (which I renamed Options, just to be clear what it's for), type the entries that you want to appear in your drop-down list. Sort your data in the order you want it to appear in your drop-down list. Select all of your entries, right-click on the selected cell group, and then click Define Name from the context-menu. In the Name box, type a name for drop-list, for example, B4_duration, and then OK. Name can't have spaces or dashes and must start with a number or digit. The name will link the values to your drop-down list. Go back to your main worksheet. Click in the cell in the worksheet where you want to use the drop-down list. From the ribbon menu, select Data, Data Validation. On the Settings tab, under Allow, choose List, then tick the box for In-cell dropdown. In the Source box, type and equal sign followed by the defined name you gave your list, so =B4_duration. I could as easily click the source select icon on the right and use the mouse to choose my worksheet and values list. 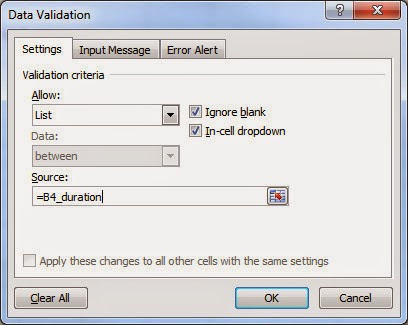 The B4 cell on my main worksheet now changes to a drop list. You would do the same for your second drop-list. If you are an old-school Excel user addicted to manual sheet and cell references, you could set your list source to =Options!$A3:$A4 which also works.